Sean Wilson recently earned the rank of Eagle Scout, completing his project at Ingram Pond in Millsboro. Wilson plans to attend college as a music education major. The rank of Eagle Scout is highly lauded, as many young Boy Scouts never attain the position. 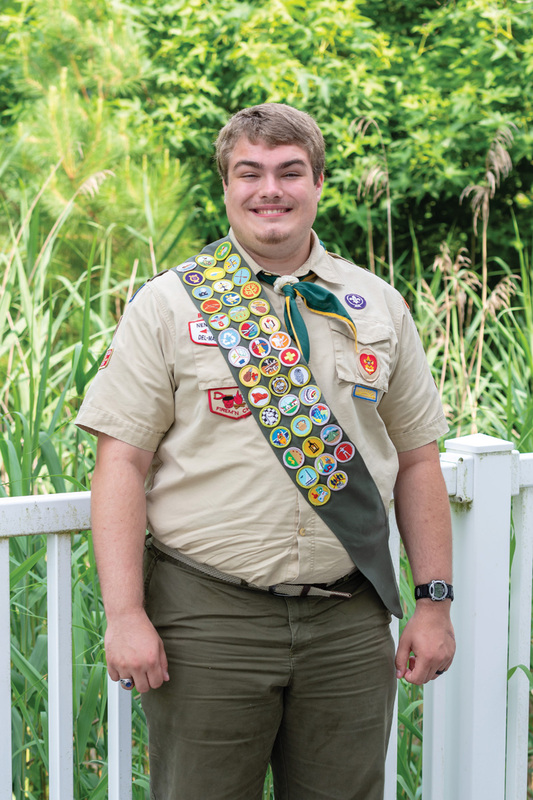 But 18-year-old Sean Wilson of BSA Troop 281 was able to go the distance and become an Eagle Scout. Wilson’s project was to build and install an education display unit at Ingram Pond in Millsboro. In August 2017, the need for an education display unit — which consisted of a table and cabinet — was expressed to Wilson. He then went through the process of design, approval and construction, with the physical project being completed at the end of February. Wilson raised about $1,200 to fund the project, with donations from friends, family, local businesses and area charitable organizations. Contractors for a Cause donated $500 to the project, and Solid Image in Laurel donated a piece of granite and associated labor. Wilson said the project took about two days to build and one day for installation, with approximately 20 Scouts and adults helping. Helping Ingram Pond seemed like the perfect project, said Wilson, as he had been to the facility for school field trips and Scout campouts. Wilson said there were many people to thank, including Scout dad Nick Kypreos and Wayne Stacey. He also thanked his parents for their support. “I would like to thank them for all the support they gave me throughout the process. My dad kept me in line, in terms of the paperwork. My mom helped me throughout — she’d look over my paperwork and find my mistakes, and sometimes add a few,” he said with a laugh. “I’m extremely proud,” said Sean’s dad, Paul, an assistant Scout master. “I think the goal when he joined Scouts was not for him to get Eagle — the goal was to have fun and learn things and experience things. He would’ve stayed in Scouts whether he got his Eagle or not. He enjoyed it. But I’m very glad he went the extra step and got the project done. Wilson joined Cub Scouts as a third-grader and, as he got older, chose to remain a part of the organization. “I actually had a friend who had talked about a couple of the events they did, and they sounded pretty cool to me. I figured I’d branch out and try something, so I went and joined. I enjoyed what they did and the fun that happened. Going through Cub Scouts, it was fun. I learned a lot. Wilson encouraged younger Scouts to stick with the organization and to work for their Eagle rank. Paul Wilson said being involved in Boy Scouts is a good activity for young men. Currently, Troop 281 has about 50 registered Scouts, with about 40 of them very active young men. Later this summer, Sean Wilson, who graduated from Indian River High School, will attend West Chester University to pursue a degree in music education. During his time at IRHS, Wilson played trombone in the school’s many ensembles. Sean Wilson has also performed in marching band, concert band, pit band and honors band, and was selected to perform in All County Band and as the first chair trombone in State Band, which pulls from high school musicians across the state. He even performed in a baroque group, which performed at the Dagsboro Tree Lighting ceremony and competed in renaissance festivals in Pennsylvania. While at college, Sean said he hopes to continue with Scouting, when time allows. On Aug. 4, surrounded by friends and family, a Court of Honor ceremony will be held to recognize Wilson’s rank achievement.